Users can now place free video calls with Messenger, as Facebook continues to extend the app beyond simple text-based chats. With the feature, Facebook is also taking a jab at competing products like Apple's FaceTime, Microsoft's Skype and Google Hangouts. Facebook previously allowed video calling through its site on the desktop, but not within its Messenger app. The video calling feature is available in the iOS and Android Messenger apps. iOS users will be able to video chat with Android users, and vice versa. It began rolling out Monday in the U.S. and more than a dozen other countries including Mexico, Nigeria and Uruguay, with availability in more regions slated for the coming months, Facebook said in a blog post. 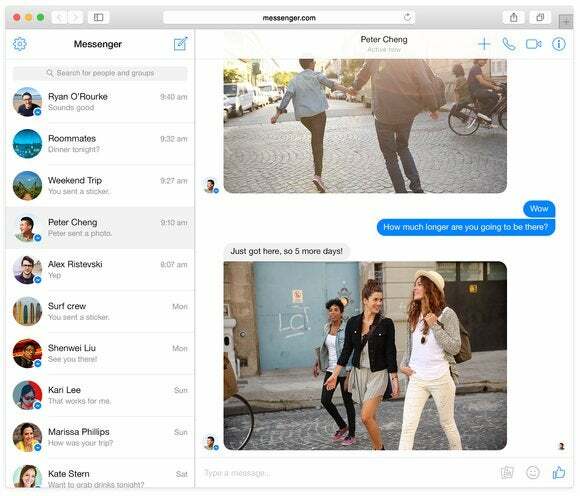 The feature arrives as Facebook makes Messenger a platform for a variety of digital tasks. Other app developers can now integrate their software into Messenger, and users will soon be able to interact with businesses via the app to check the status of their orders. In March, Facebook began letting Messenger users send each other money through the app. Messenger already handles more than 10 percent of all Internet-based voice calls, according to Facebook. The company sees video as an important extension of its functionality, especially when a voice call won't do. To start a video call, users tap the video camera icon in the upper right corner of the chat window. With Messenger now available on the desktop, the feature could become a useful communications tool for businesses. It's designed to work over Wi-Fi and LTE even when the signal strength is low. With more than 600 million users who log in monthly, Messenger is one of Facebook's most popular apps. Facebook-owned WhatsApp, meanwhile, supports voice calling, but does not yet offer video calling.